Sihanoukville is a coastal city in Southeast Asia named after King Sihanoukville in the 1960′s. It is in Cambodia. Sadly, King Sihanouk’s reign was short-lived because Pol Pot and the Khmer Rouge army executed him and all his allies and took control of Cambodia. In just four years from 1975 to 1979, Pol Pot washed away all the good things that the Cambodian government was doing for its people and for the reputation of their country. So, today, Cambodia is more easily remembered for the atrocities of the evil Khmer Rouge Army and its stone-hearted despot, Pol Pot, instead of King Sihanouk, scenic Sihanoukville, and the beautiful Sihanoukville beaches, including Sokha Beach. After Pol Pot, Cambodia saw more years of internal conflicts and instability. It was only in 1998 that the country had some kind of peace and national direction. Prior to 1998, a few Khmer Rouge remnants still instilled fear and danger in the hearts of millions of Cambodians. During his reign, Pol Pot executed over 2 million people and so today there is not one Cambodian without a traumatic experience of having a friend, family or relative murdered. The capital city of Phnom Penh was the first to rebuild, but after the roads leading to Sihanoukville were paved, hordes of backpackers, travel enthusiasts, and tourists began steadily pouring into Sihanoukville as well. Located in Southern Cambodia jutting into the Gulf of Thailand, Sihanoukville is Cambodia’s prime coastal city, the only developed and commercialized city outside Phnom Penh. Even before Pol Pot, there were active international commercial trading activities at the port of Sihanoukville. Today, the port is once again attracting international business as it welcomes cargo ships, cruise ships and naval ships from many countries around the world. 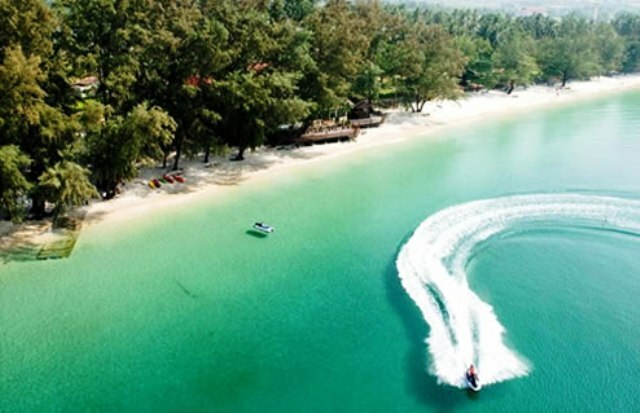 Slowly, Sihanoukville is gaining recognition as a not-to-be-missed tourism city in this part of the world. In addition to its friendly people and inviting natural wonders, it mostly attracts tourists with its world-class beaches. There is not much to say about Sokha Beach except five important words: fun, sun, sand, water, paradise. It’s what every island vacation should be. The water is warm all year and perfect for all sorts of exciting water sports. What sets Sokha Beach and all the other Sihanoukville beaches from the rest of the beaches in Asia is that here in Sihanoukville, the beaches are unspoiled, tranquil and with not many local hawkers. The opposites are actually the put-offs in other beach destinations in Asia – too commercialized, too noisy, and with too many hawkers. Sokha Beach is all about nature, and it is not far from the Ochheuteal Beach, Independence Beach, and Serendipity Beach. To make the experience even more pleasant and memorable, hotels, restaurants, cafes, and cheap shops are lined along or around Sokha Beach for everyone’s good pleasure.